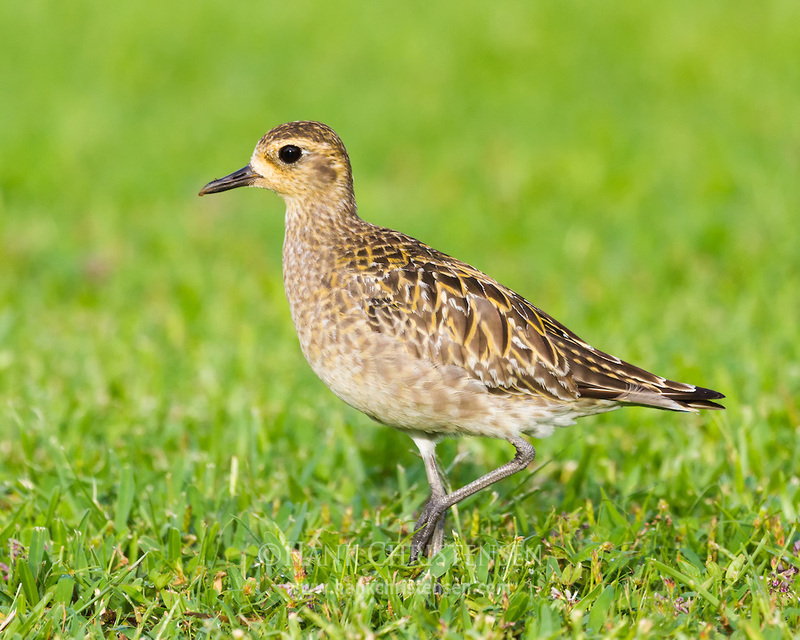 The Pacific golden plover (Pluvialis fulva) is a medium-sized plover, and it is believed that golden plovers flocked when rain was imminent. 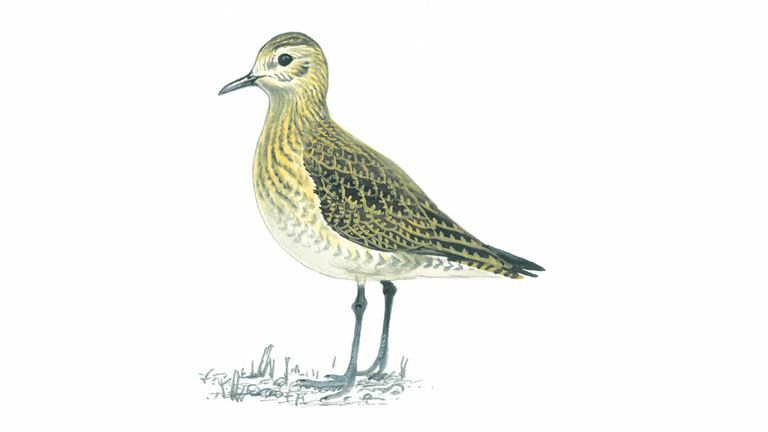 The Pacific golden plover is 23 to 26 cm long breeding adult is spotted gold and black on the crown, and back on the wings. The bird face and neck are black with a white border, and it has a black breast and a dark rump. The legs are black. In winter, the black is lost and the plover then has a yellowish face and breast, and white underparts. 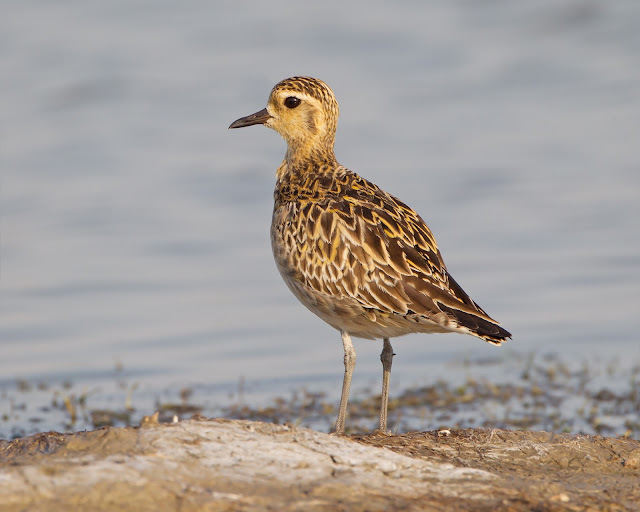 It is alike to two other golden plovers, “The Eurasian” and “American plovers”. The Pacific golden plover is smaller, slimmer and relatively longer-legged than the European golden plover, also has white axillary feathers. 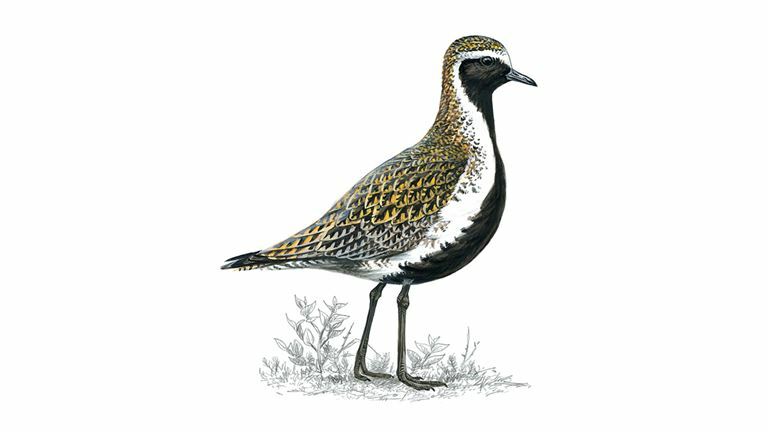 Generally, the Pacific golden plover is found to be more comparable to the American golden plover, with which it was once considered conspecific as "lesser golden plover". The Pacific golden plover is slimmer than the American species, has a shorter primary projection, longer legs, and is habitually found to have more yellow on the back. This wader forages for food on tundra, fields, beaches and tidal flats, frequently by sight. The birds like to eats insects and crustaceans and some berries. 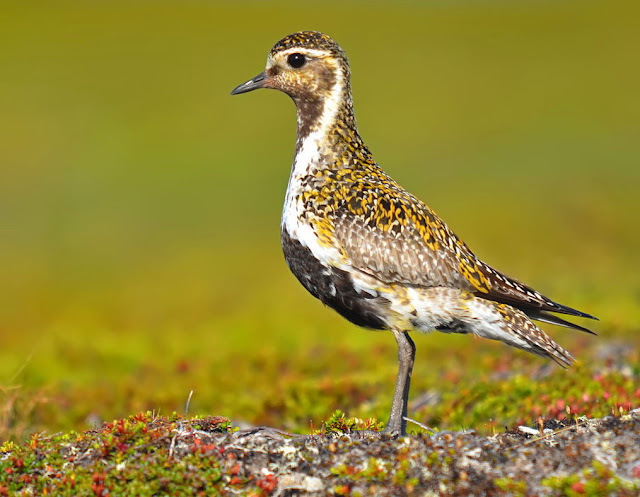 The breeding habitat of Pacific golden plover is the Arctic tundra from northernmost Asia into western Alaska. It nests on the ground in a dry open area. It is migratory and winters in south Asia and Australasia. A few winters in California and Hawaii, USA. In Hawaii, the bird is recognized as the kōlea. It is very rare vagrant to Western Europe. They return to the same wintering territory each year, which allowed scientists in Hawaii to attach tiny light level geolocation devices to the birds and then retrieve them the following year in the same location. 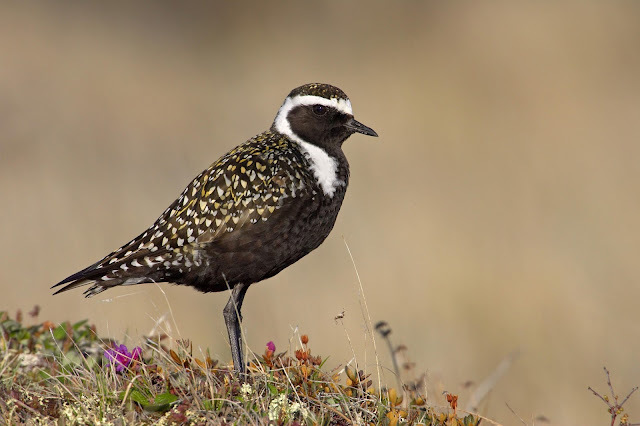 Moreover, a study revealed that these birds make the 4800 km non-stop flight between Alaska and Hawaii in 3 to 4 days. In winter they form large flocks which fly in fairly tight formation with fast, twinkling wingbeats. Plover is a large shorebird of pastures, open ground, and mudflats, makes one of the longest migratory journeys of any shorebird. It breeds on the high Arctic tundra of Alaska and Canada and winters in the grasslands of central and southern South America. 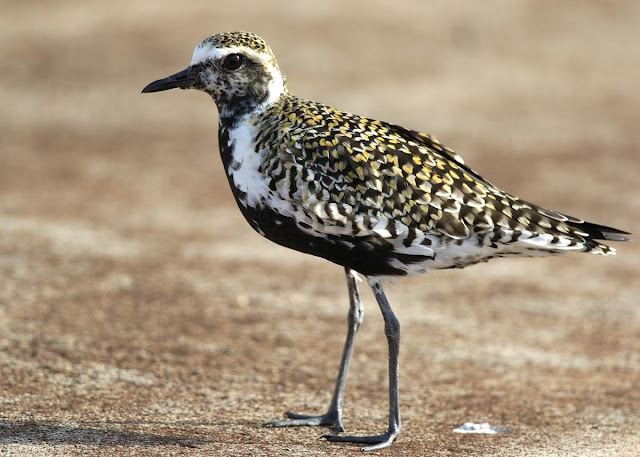 However, the American Golden-Plover “Pluvialis dominica” has a long, circular migration route. In the fall it flies offshore from the East Coast of North America nonstop to South America. On the return in the spring it passes primarily through the middle of North America to reach its Arctic breeding grounds. Adult American Golden-Plovers leave their Arctic breeding grounds in early summer, but juveniles usually linger until late summer or fall. Some adults arrive on the wintering grounds in southern South America before the last juveniles have left the Arctic. The oldest American Golden-Plover was at least 13 years old, when it was recaptured and rereleased during a banding operation in Alaska. The bird feeds in short vegetation or open areas and moves by stop-run-stop, scanning and capturing prey at stops. Captures prey by single peck or series of pecks. The hoopoe is a medium sized colorful bird, almost 25 to 32 cm long, with a 44 to 48 cm wingspan. The bird weighs is approximately 46 to 89 g. The species is highly distinctive, notable for its distinctive “crown” of feathers with a long, thin tapering bill that is black with a fawn base. The strengthened musculature of the head allows the bill to be opened when probing inside the soil. The bird has wide and rounded wings gifted of strong flight; these’re larger in the northern migratory subspecies. The bird has a characteristic undulating flight, which is same that of a giant butterfly, caused by the wings half closing at the end of each beat or short sequence of beats. The hoopoe or Upupa epops is the only extant species in the family Upupidae. Well, same as Latin name upupa, the English name is an onomatopoeic form which reproduces the cry of the bird. The hoopoe is the national bird of Republic of Israel. The bird is named after its vocalizations, the Eurasian hoopoe emits a low “hoop, hoop, hoop, hoop”. The pinkish brown to chestnut plumage with black and white bars and an inspiring fan-like crest make the Eurasian hoopoe instantly recognizable. The Eurasian hoopoe forages mainly on short grass and bare soil for invertebrates.